Artistic obsession can destroy you. If you are an artist of any sort I am certain that you know the meaning of that statement. Whether it is true or not is open to debate. The Symphony is a surrealist film made with the Exquisite Corpse technique by Michael LaPointe that examines this very predicament with the no holds barred lens of an auteur. You’ll never know Ray’s name. You’ll know his desire: he’s a self mutilating musician who is slowly killing himself to make an album. Why? Because he sees it as his legacy to the world. 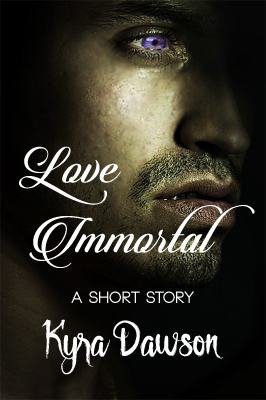 As blood drips down his stomach he questions if a legacy is worth his life. As blood drips, he cuts himself more and more… “Death is worth the world.” A narrative feature film. In the opening sequence Ray (Robin Zamora) heats an exacto knife blade with a flame and proceeds to cut himself. It’s a practiced and studied motion that seems like a ritual that will make you cringe. Here is an artist that is truly suffering for his art. Like most cutters he cuts to feel but his methods are twofold; he also cuts to encourage hallucinations so that he is able to compose music for his album, his magnum opus. His hallucinations are something out of a fever dream, and frightening and disturbing as they are they are the inspiration he needs to compose his album. Ray has checked out of his life, the only things he seems to feel is the pain from his self mutilations and the need to create his legacy. His girlfriend Samantha (Marissa Merrill) is callous and somewhat oblivious to what drives him, almost uncaring about his inner turmoil yet worried about his state of mind and health by rote. To even the most casual observer his devotion to his craft is an unhealthy obsession. On the one hand it is understandable what he trying to achieve; everyone wants to leave a part of themselves behind to fulfill their need to prove that they existed, that they mattered. But this is an extreme sickness Ray suffers from, claiming to need cutting in order to create is simply a way to justify what he is doing to himself. Do we all destroy ourselves to attain our dreams? All artists go through periods of drought in their creative exertions, even those who are the most prolific, but would the majority of artists injure themselves to stimulate the process of creativity? 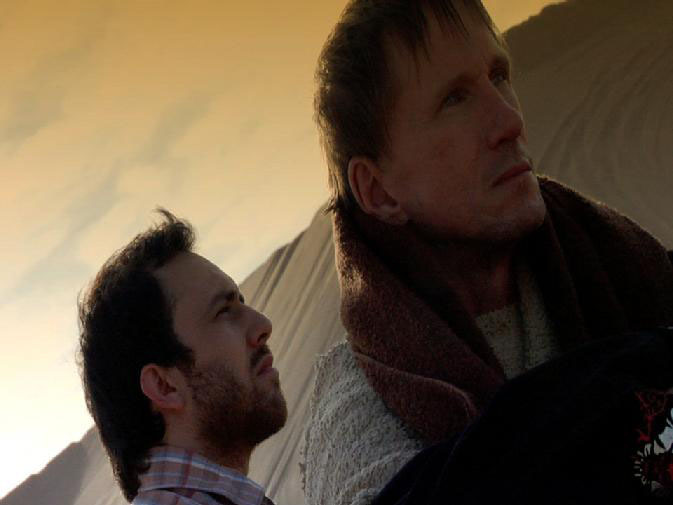 Ray (Robin Zamora) and Chancelor (Bill Oberst Jr.) in the desert. Ray helps a stranger who proves to have a pivotal role in his endeavor to acquire posterity. The existence of Chancelor (Bill Oberst Jr.) seems to coincide with Ray’s discovery that his piece needs someone to die. His girlfriend briefly becomes his proxy cutter but Ray realizes that it must be him who who suffers in order to create. He’s searching for an elusive sound, and his searching leads him to wander into the area of the occult. Names like Aleister Crowley and Victor Neuberg and notions that selling one’s soul for art intermingle with Ray’s idea that death will give The Symphony a perfect ending. It also coincides with the belief that the self mutilation of oneself gives the mutilator the ability to transcend the earthly plane into bliss. Ray finds a willing partner in this radical concept in Chancelor who sees Ray as the Victor Neuberg to his Aleister Crowley. Their journey to the desert follows in the footsteps of Crowley and Neuberg where they also search for a portal to the mystical freedom they both desire. 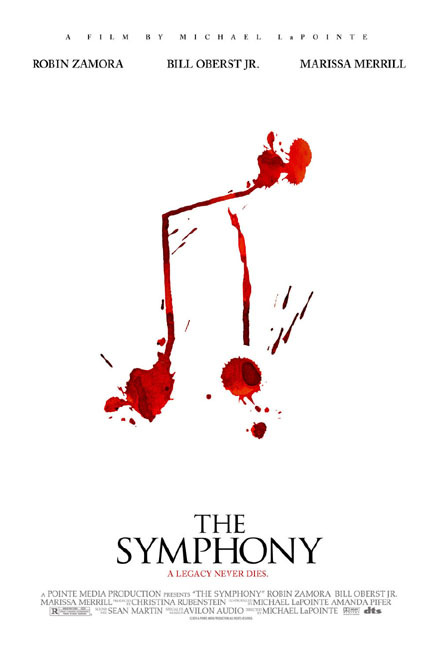 The Symphony is an exercise in sublime, macabre surrealism; the story of a man searching for the profound while composing his magnum opus and ode to obsession. The moral of the story is total abandonment to your passions can lead to your very destruction. Is the completion of his album within Ray’s grasp? Is what Ray after worthwhile? This is the question The Symphony poses and only you can be the judge of the answer to that query. The answer is different for everyone. ***Warning! This trailer contains graphic content. 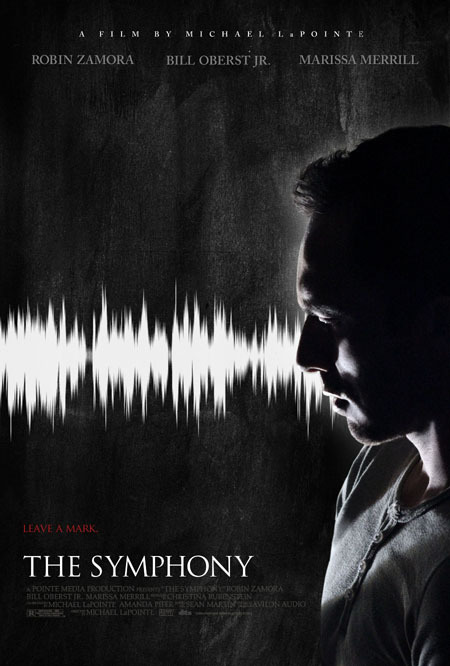 The Symphony Movie Trailer from Pointe Media on Vimeo. Aleister Crowley, artistic, artists, auteur, Bill Oberst Jr., Exquisite Corpse technique, film, indie, Indie Film, indie filmmaking, Indie Spotlight, macabre, macabre surrealism, Marissa Merrill, Michael LaPointe, movies, obsession, occult, Pointe Media, posterity, reviews, Robin Zamora, surreal, surrealism, The Symphony, Victor Neuberg. Bookmark.